Do we all have multiple personalities? Yes, we all have multiple subselves or subpersonalities that each have a different role and purpose. There are a variety of ways subpersonalities can form and at times they can cause us stress and anxiety due to the internal conflict that arises. But ultimately, learning about these personalities, their purpose / reason for existing, where they originated from, how they are triggered / take control, and letting them express themselves, makes it easier to get along with them and let them fulfill their purpose to enhance the quality of our lives, and fully understand ourselves on a much deeper level. Hi everyone! Do you believe we all have multiple personalities? Do you think it is just the one ‘us,’ the singular self, or are we multiple, multiple selves? You would be correct in saying that we are all multiple since there is no such as thing as the singular self. We all have multiple selves, subselves, personalities, alter personalities, ego states, identity states, subidentities, whatever you wish to call them. This video will discuss these subpersonalities, as well as them taking control / switching, integration, and when it becomes a problem, like in multiple personality disorder or dissociative identity disorder. Before I begin, I highly recommend this book. “Discover Your Subpersonalities: Our Inner World and the People in It” by John Rowan. I’ll have a link to it on Amazon.com in the description. You can buy a physical copy, or digitally on the Kindle store, even if you don’t own a Kindle you can download the free Kindle app on your computer to read it. Or download it on a mobile device or tablet or whatever. What I’m saying is, if you are interested in this sort of thing, check this book out. It discusses ways these subpersonalities can form, how we can discover our own, even exercises we can do to learn more about our system. Even dissociation and some multiple personality disorder in there as well. But more importantly, it has actually helped me quite a bit and allowed me to understand myself better and feel like less of a freak. Knowing that what I’m deal with inside myself is very real and not uncommon. And, I thought I was completely nuts and insane. It even discusses some common subpersonalities we may have such as the protector, critic, perfectionist, inner child, parent, and so many other ones. And, it’s just really eye opening and as I said, it made me feel like less of a weirdo knowing that this is real. So, if you are struggling with this or want to learn more, this book is quite educational and goes into much more detail than I could possibly cover in one video. Anyway, just what are subpersonalities? Well, they are essentially different parts within ourself, that make up our personality as a whole. They may have different views on things, thoughts, even mannerisms and voices, whatever else. The combinations are limitless. And, while there may be some common ones we all have, each person has a unique system of subpersonalities and how they interact. We’ve all experienced the split self. But, many times we don’t know about it because it is natural to us. We hear that inner voice telling us things, sometimes good, sometimes bad, and we may have an opinion opposite to what it thinks. We may ‘do battle’ with ourselves in a sense, conflict in our minds, or indecisiveness / confusion. I’m sure a lot of us have said, “I don’t know what came over me,” “I don’t know why I did that,” or “part of me feels this way,” or “a side of me is like this.” And, to a more serious degree, we may not even remember doing certain things or have gaps in our memory. Let’s look at a basic example of the split self. Let’s say you are overweight and you really want to start eating well, exercising, taking good care of your health. That’s personality number one, the goal oriented one that is motivated and persistent. Then, there is that voice in your head like, “Oh come on. Just one more. You know you want to.” You know, persuading you into eating more and distracting you from your goals. That’s number two, perhaps a child persona. And lastly, you give in and while you are eating, or afterwards there is that other voice of shame that’s like, “Look at what you did you fat, disgusting slob. I hope you feel bad with yourself for what you did.” Aggressive and demanding. That’s number three, the critic, or perhaps a parent. All of these are alter personality states. You have the side of you that wants to get healthy, and eat right. Then another that just wants to lounge around all day and eat junk. Then the other one enforces and demands you get fit. So much to the point that it’s like a bully, an abuser, harassing, insulting. All these alter states exist because there is conflict with your own body image. With this example, you are feeling insecure about yourself and the way others perceive you. You want to lose the weight, but at the same time perhaps don’t want to exercise or give up the food, as well as being upset and angry about your current body image. But, there could be a block, or some denial that you do not recognize or acknowledge, and it manifests into these three separate ego states that possess these three qualities. This internal conflict can cause stress and anxiety for the individual and coming to terms with it can be tricky. Another example would be a child at school and at home. They can behave like complete opposites in these two environments. They could be very well behaved at school and make a good impression on the teacher. Then at home, they are aggressive, demanding, violent. Or, it could be the opposite of this example. And, another would be a parent playing with their child. That could bring out the parent’s inner child personality to play with their own child. Subpersonalities always serve a purpose, they are there for a reason. What that reason is depends on many factors. If they are a protector, their goal is to protect or shield certain aspects of the world from the core or other personalities. The critic is there to push your buttons and make you feel like you are not doing anything right, but it could also be a great motivator. There can be any combination of subpersonalities, their purposes, and the reasons for their existence. There are many ways subpersonalities can form, and these are just a few examples one may experience. Dissociation is a major component and how our mind is compartmentalized. When we are dissociated, perhaps absorbed in a book, television show, driving, fantasizing, that is generally a lower level of dissociation. Subpersonalities are a step above this in terms of dissociation, and a further step above that are dissociative disorders and then multiple personalities, dissociative identity disorder, which I will discuss later in this video. Denial is another factor. Like, being in denial about something going on in your life or something that happened to you, denial for any sort of reason, and you may or may not be aware of it. Then you can develop a subpersonality that will have those repressed emotions and memories because, even when repressed, or how you much try and dissociate yourself from it, these emotions do not just simply go away. Subpersonalities just don’t go away on their own. When you repress and deny things within yourself, you are creating internal conflict which in turn will feed these subpersonalities that possess these traits. The denial and issues would need to be addressed, felt, and then let go, with a proper resolve. If you cannot deal with it, you have to deal with it in order to sort out the issues. Traumas, especially during childhood, play a large role in the development of these subpersonalities as well. Even to the point of it becoming problematic. Generally the more extensive the abuse, can be physical, emotional, sexual, the more dissociated and distinct these personality states can be. I don’t like to say the more ‘severe’ the trauma is, because that would be giving ‘severe’ trauma specific criteria. And, trauma is subjective and unique to that individual. What may be severe to one, may seem like nothing to another individual. So, pretty much all trauma is severe to the person that experiences it because it is a life changing event that can, and will be, with the individual for the rest of their lives unless they can learn to heal some of those deep-rooted psychological wounds, and this can take years of therapy. Many times those that have experienced trauma can have a voice in their head, an alter personality state, that is exactly like the abuser. And, the only way to mend those wounds from childhood is to go back to those traumatic memories, reexamine them, feel the emotions and memories as they were at the time, and then let it go. Perhaps be a good parent and comfort that child, that child that you once were. Showing them love and acceptance and letting go of the negative situation and memory. Maybe even reconstruct the memory so it is positive. Don’t give up until you are satisfied and how you want it to be. Subpersonalities can form from other people. You can take on traits of the person or people you are with or have encountered in your life, perhaps picking up on their energy and developing some of their traits. We modify ourselves and presentation to others in different situations, and many times we are completely unaware of it. You can, many times subconsciously, adjust who you are to better suit the people you are with. This is why it’s always best to pick people you enjoy being around since if you don’t, you could pick up on some of their qualities that you do not like and incorporate them into your personality. Next, we encapsulate people, especially during childhood, as we perceive them into our subconscious and they become subpersonalities. So, let’s say that a child has incorporated an image of its mother into their subconscious so the mother is always with the child, but in the child’s mind. Perhaps when the mother is temporarily away and the child wants something, they ask their mother subpersonality, “What would mother say?” And, they will more than likely know the answer and can communicate with their representation of their mother. Of course, they could defy this voice. Another example, let’s say when you were younger your father was very strict with you. He was not only there when you were a child, but still there in your mind 10, 20 years later. This is your internalized father, a subpersonality of your father that lives in your subconscious. Every time you do something, there is that inner voice of your father, “Don’t do this, don’t do that. You’re not doing it right. Do it better. You’re making a fool out of yourself.” Your parent figures stay with you and become subpersonalities. Another thing, have you ever noticed that when there is someone we look up to or a role model, you will take on their qualities as you perceive them? It’s how you view them and see them. You identify with heroes and other figures and take on their characteristics from your perspective. You can develop a possible self or what you would want to be like in the future. You create qualities for them, perhaps based off role models, and then work at becoming that which you imagined. You work towards that goal of being like them and succeeding at the goals you laid out for yourself. And lastly, when you play a role in society, you develop a subpersonality corresponding to that role. Like if you have a job as a teacher, you will develop a teacher subpersonality, and so on. In a sense, it is a lot like acting or role-playing. You playing a role of something or someone and you become them and develop a subpersonality for them. Now, I will discuss personalities taking control and switching. Many times we switch according to whom we are with, or the environment we are in. So, if for example you are a teacher, you have that teacher subpersonality when you are at work. Then, after work you go out partying with your friends, which would be a separate subpersonality. Then you go home and you are a busy parent of several children. Again, another subpersonality. So, there are three at play with this example, the teacher, the partier, and the homemaker / family oriented one. All three of these behave very differently and independently of one another. Let’s say children are behaving badly in the classroom, there may be a switch to the family personality to reprimand the students like they were your own child. Or, you may have a completely different way of handling the situation. It depends, there are no strict rules. It wouldn’t be uncommon for this individual to have a switch in personality at these times. Because after all, the children acting up in class could trigger the family personality to come out and discipline them. This is because it is the family personality that disciplines the children when at home, and now children are acting up at school and out comes the personality from home to do the job. Many times we are not even aware of this. However, sometimes these personalities can be triggered or take control at inappropriate times. And to a severity, they can wreak havoc on our lives because we cannot control when they come out or take control. And to an even more severity, we may not even be aware of what they are doing when they are out, or even know them in the first place. So a good question to ask then is, how could you consciously switch personalities, to perhaps get better control over switching if it is problematic or uncontrollable? Learning more about ourselves, and the various parts of our personality, these subpersonalities, what triggers them, their purpose and role, it can help us utilize their abilities at times that are more opportune. Switching doesn’t occur consciously, but rather subconsciously. You may or may not be aware of it, depending on a variety of factors. If for example you were home and wanted to switch to this teacher persona. Well, this may seem difficult at first but it’s not once you learn how to do it. Trying to be this teacher personality by force, like trying to act it out, will not get you anywhere since you are making a conscious effort. A key is to allow the teacher personality to express themselves in this environment. It’s not forcing a switch and making it happen, rather it’s allowing it to happen. And, that is the key. So, allow this teacher personality to emerge and come out to express itself. Pretend, role-play, act out the part like you were at work, not by force, but through allowing. Allow it to happen and things will come naturally. You will switch to the teacher persona, especially if you have convinced yourself you are this teacher personality and allowed it to happen. It depends on how suggestible you are and how well you can believe your suggestions. The more suggestible, the easier it will be. Because suggestibility and ability to dissociate are key factors as well. Which bring up another important topic, hypnosis. Hypnosis is dissociation. You dissociate yourself, give yourself suggestions, and then ‘come out’ of the hypnotic state believing these suggestions. If you would like to know more about this, please watch my video on dissociation and hypnosis as this will provide more detailed information in this area. [Dissociation & Hypnosis] But anyway, you can hypnotize yourself, using a wide variety of methods, give yourself suggestions, perhaps that you are this teacher personality. Then, you will believe that you are this teacher personality and would’ve successfully switched to them. Again, this happens subconsciously. By consciously trying to force a switch and not allowing, you’re really not going to get anywhere. So, while it is all subconscious, you can make a conscious attempt to let go and allow it to happen instead of forcing it. That would be the most efficient way of learning how to switch personalities. The next topic is integration. Just what is integration? It sounds like it means when separate personalities merge into one and are no longer present. And technically that is not necessarily what happens. There is much more going on actually. The goal of integration is not to eliminate the personality from the system or merge it into another personality, but rather resolve conflict and allow the personalities to work together in harmony within the system rather than destructively. The more well balanced your system and personalities are usually indicates the more integrated they are. When they are dysfunctional and causing a lot of problems, the more dissociative your system. 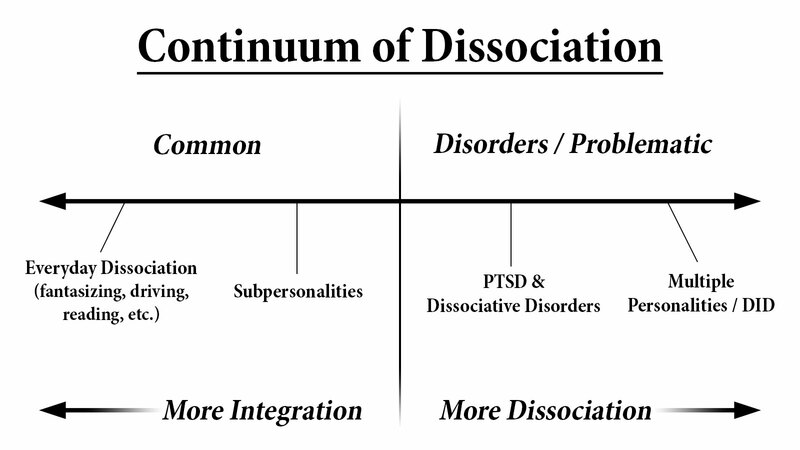 So, it’s more integration, less dissociation, while less integration, more dissociation. As I stated earlier with denial being a way for a subpersonality to form, personalities just don’t go away on their own. The issues would need to be addressed and then let go with a proper resolve. It has to be dealt with for the personalities to work together. Otherwise, there will be chaos and an imbalance in your system. The first step is to get to know the various sides to yourself. What do they want? What are they trying to tell you? Why are they there? In order for you to get to know your subpersonalities, you have to be them, play the part, and not just observe and describe them and their behavior. You have to role-play. Play that part, act that part, be that part and you will see what these personalities are trying to tell you. Becoming aware of these personalities is as simple as becoming aware of internal conflict, such as what is being repressed and denied, blocked out. Let them express themselves since that will allow you to understand them better, and ultimately, yourself. This means having a conversation with yourself and these personalities, which some people may think, “Oh, only crazy people talk to themself.” And, that is not true, we all do it and it’s nothing crazy. It may seem weird, but it’s not. You can uncover a lot about yourself by communicating with yourself. Don’t be afraid to ask yourself questions and hear a response from your subpersonalities. Talk to one of these personalities, ask them, “Why are you here? What are you doing?” And then switch to this other personality and answer. Learn from this experience and it will allow you to learn more about yourself. Have two or more chairs, and assign a personality to each and sit in one and ask the other a question. Then, when it feels right, sit in the other chair and answer as that personality, saying what comes to you naturally. After some time of this, you may discover some repressed emotions and feelings you were not aware of before which may be causing you some internal conflict. So then, is there any resolution that can come of this? Only you can figure it out by confronting these personalities, being them, and understanding what they are trying to tell you. It’s your subconscious’ way of giving you answers to what you should work on for personal growth. After that, and you have recognized where the major conflict comes from and have resolved it, talked through it, found a solution to your problem, then the personality don’t just vanish, but it becomes manageable and non-problematic. That is what integration is. Not merging personalities, but resolving the conflict that is causing them to be as pronounced as they are. Now, I will discuss when the concept of subpersonalities and dissociation is taken to a more extreme level and causes an individual a lot of problems and conflict in their mind. This is dissociative identity disorder, which is also known as multiple personality disorder. It’s the severity of the multiple personalities that distinguish DID and how integrated personalities are in your system. Is it down on the lower end of the spectrum, such as it not causing much of any problems. Or, is it debilitating, severe, causing problems for you. That is when dissociative identity disorder would come into play. And usually with DID comes more dissociation, so much that you can lose track of your time, not remember people, places, events, all sorts of things. Additionally, you can experience a loss of self, identity confusion, not knowing who you are, a kind of blurred sense of self. The further you go down this scale of dissociation the more severe it becomes, which usually means the more unhealthy the condition is. The best way of describing DID is well, take everything I mentioned previously about subpersonalities and amplify that tremendously to the point where it becomes problematic. Generally less integration between at least two different personalities which is generally combined with dissociation. That’s not saying these altered states cannot work in harmony and be integrated, but usually before this, the condition can be disastrous because there is a lot of conflict between these states, in addition to denial. A big component of DID besides denial and dissociation, is hypnotizability and suggestibility. This is a crucial part of DID since those with DID tend to have the highest hypnotizability of any group followed by those with PTSD. And, this is because trauma plays a very important role in dissociation. By dissociating, you are hypnotizing yourself and when in a hypnotic state you are more suggestible. However, trauma is not necessarily the key component of DID since it can happen to those that haven’t experienced trauma. Those with DID that have not experienced trauma to cause the split, are more suggestible, and this could be due to a variety of factors. It could also be caused by overanalyzing, hypochondria, maybe even being convinced by a therapist, misdiagnosis or an iatrogenic condition. There are many misconceptions about this topic, and even more so with dissociative identity disorder since many people do not believe such a thing exists. So, a question to ask then is if it’s possible to fake or act multiple personalities? Well, what do you think? Let’s analyze this. Faking would be acting, and acting is putting on a mask of someone or something else. Someone that is not yourself, taking on a new personality. The process of pretending to be someone else is putting on a different mask. Make sense? Even when trying to fake or act, the person becomes a different character, with different traits and thinking, thus making it so that they are a different person. Ah, starting making sense now, right? It’s not possible to fake because the process of being someone else is in fact part of multiple personalities. Those with DID, well, let’s amplify that and then add extra suggestibility and that you are this alter personality, and then make it problematic to the individual with more dissociation and less integration. Make sense? Another topic to bring up here is the correlation between DID and borderline personality disorder. While these are two separate disorders, many of those with DID also fit the criteria for borderline personality disorder. Well, with borderline, many times an individual will see things as all good or all bad, black and white thinking. They can have an extremely good opinion about something one minute, and then change it the very next. And, this type of thinking is the same with alter personality states. One may be in favor of something, and another be against it. And, when you combine that with more distinct personality differences and severe dissociation, then we are in the realm of borderline or DID. This is why many of those with DID, also fit the criteria for borderline. But, the difference when it comes to altered personalities is that with DID the ‘alters’ are more distinct and can often been seen as quite dissociative, they can have an array of emotions and can not be as limited. Whereas in borderline it seems to be more about unstable emotions of the one personality, or rather, of the multiple subpersonalities. In terms of dissociation and ‘alters,’ DID would be on the more severe end, while borderline would be lower than that, but above normal subpersonalities. But, borderline would be high on the scale of emotional instability. And lastly, I would like to talk about my personal experience with all this and how an alter personality formed within me and how I saw it grow and manifest, and the conflict it caused within me, and ultimately, how I managed to get it under control. It started around November of 2013. It began as a voice in my head saying, “Stop seeking attention, stop faking.” It was relatively quiet. As time went on, it grew louder and louder. After about a month from when it started to form, it got to the point where it was screaming inside my head. Shortly thereafter, it began to talk out loud to me. It would say to me, through my mouth of course, you’re a liar, a fake, an attention seeker. Then I would switch and was having a conversation with myself. Back and forth conversation between the real me and this unknown personality. And, that really got to me and made me so depressed and felt like I was losing control of myself. It would even recite exact quotes of these people online who commented on my videos that call me fake, attention seeker. Practically word for word. Every time someone would call me fake online, it would be triggered and come out and say these hateful things to me. I was terrified to read any comments out of fear of being triggered. And, I saw the videos I had online and all I saw was a liar and a fraud, deceiving so many people for malicious reasons. It was completely destroying me because of how low it made me feel, and how much it altered my thinking. It would then take over me, and each time was more and more intense. It told my therapist I was fake and a fraud. She didn’t understand and was lost when that happened. Then, it would hurt me and make me watch, then leave suddenly making me feel completely empty and not even knowing what just happened. Each time it would take me over, I was always there in the background. The best way of describing it is like watching yourself on a TV screen. You can only observe but cannot control what is going on. So essentially, I was mostly always co-conscious with this personality. Meaning that I and it were both aware of what was going on outside the body. But, I didn’t have control, it did. I felt as though everything I did, said, and thought was wrong. That I was a fake, a fraud. There was so much conflict within myself and I thought I was a liar and deceiving people. I was convinced that I was a fake and was constantly reminded of it all the time. Then, when I thought I wasn’t fake, I would question it again. I became so confused and kinda lost myself and my reasoning for making these videos in the first place. I didn’t know anymore. I thought I was a total freak for what I was experiencing, and I tried blocking that out and denying that. I thought I was the only one, despite all the people who have said they could relate. I thought this was only happening to me and made me feel, just not myself. This lasted for six months until I came to the realization that I wasn’t a liar. That all those people calling me fake, attention seeking, it was all their own opinion, and that opinion is not fact, and its not my reality, or what I am doing, and not real. Then, when I learned acceptance, not so much acceptance of this alter personality, but rather acceptance and trust in myself that I was in fact not a fraud, that what I am doing is the right thing. Believing and convincing myself that I am real and legitimate. Getting back and rediscovering my reason for making these videos in the first place which has nothing to do with being fake or attention seeking. It was almost as if that alter calling me fake was then defeated and it cowered in the corner of my mind. It’s still there, but it doesn’t have the power it did before. It doesn’t affect me the way it did before, just like those ignorant, misinformed comments calling me fake don’t affect me the way it did before. I am not triggered by it anymore. I felt like I reclaimed my reasoning for my life, that I finally back to myself, free from this aggressive alter that was causing a lot of internal conflict. It just amazes me that these negative comments online had the power of doing this to me. It wasn’t so much them, as it was me letting them get to me. Letting their words affect me and causing self doubt and denial within myself. But, I learned from the experience. It would point out some attention seeking ways and what not and I see that now which I changed and grew a lot from the experience. So, mainly how I handled it was to hear it out and see what it was trying to say, but reclaim my real purpose for doing these videos which was not what it thought it was. Because this unknown alter that formed, came from these people online. It was the personification of all the negativity I received online. And, I have found a much better way of channeling that negative energy so it doesn’t affect me anymore. So, hopefully you can learn from my example, that I saw this personality emerge and grow over a six month period, to better your lives and accept yourself and these alter identities as well as how to handle them and listen to what they have to say. It did help me realize some things about myself in the process, so I learned from it. And, that’s something you have to do. Look at the message it is trying to tell you. It may not be true in the sense you think it is, but there is something there that is hidden from you that you need to look at and address. So, in the end we all have experience with multiple selves. We all have natural multiplicity because it is normal for the mind to compartmentalize different things. And further yet, it’s normal and nothing to worry about unless it is causing issues and conflict within your system. By learning about these personalities, their purpose / reason for existing, where they originated from, how they are triggered / take control, letting them express themselves, it becomes a lot easier to get along with them and let them fulfill their purpose to enhance the quality of your life, and fully understand yourself on a much deeper level. So, I hope this video was informative and helpful. Thanks for watching! The moment I discovered the concept of subpersonalities was when I instantly didn’t feel alone anymore. I felt like a freak and an outcast for what I was experiencing. I thought I was a complete fraud. Yet, this was the defining moment I got control over the alter personality inside me that would call me a fake and fraud. I knew I wasn’t! Changing my perspective and knowing what I was experiencing was real was what made that negative personality lose strength. I began to see how my past experiences and how I coped is what caused my alter personalities to form. I began to understand them better and why they are here. Everything made sense and it helped bring clarity to my life!